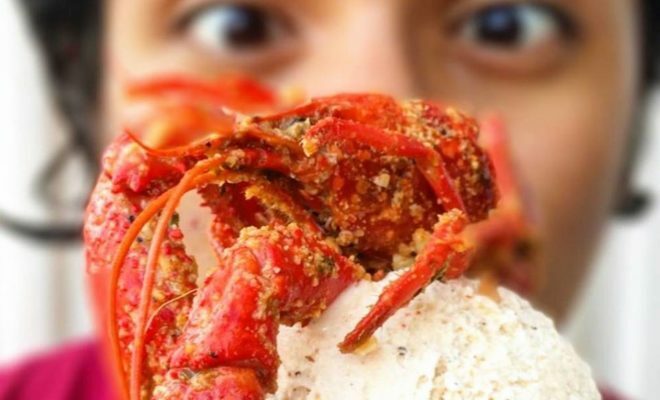 It’s crawfish season, folks, and what better way to kick it off than by trying a new concoction introduced by Red Circle Ice Cream in Houston, Texas? Get yourself a big scoop of the Crawfish Ice Cream! Would you dare to try this newest flavor from a franchise known for creating interesting combinations of treats? This crawfish boil in a cone will bring out all the savory and spicy flavors you enjoy in a good old fashioned crawfish fest. In honor of the popular season, Red Circle released this interesting flavor to rave reviews. The reviews were so great, in fact, that they sold out over the weekend, but they promise to have it back in stock ASAP and will keep you posted. Houston’s local Fox26 morning anchors were lucky enough to have Nickey NGO of Red Circle in the studios to sample the unique treat. Check out the video above! Red Circle Ice Cream opened its doors in August of 2017 in Houston, Texas, and has grown in its popularity as it debuts interesting and memorable desserts that keep you coming back for more. One look at their resume of impressive dessert delicacies on their website and Instagram will leave your mouth watering for menu options such as the Churro Daddy. If you live in Texas or anywhere in the south, for that matter, you know how big a deal crawfish season is. There are festivals held all over various towns and family gatherings planned around the much anticipated season. Crawfish can be tricky to crack open and enjoy, that’s why this newest ice cream sensation is a great alternative. For more about this unique ice cream shop and to keep tabs on when you can have a shot at tasting their newest flavor, be sure to follow them on their social media or website at www.redcirclefranchising.com. Did someone say road trip to Houston?